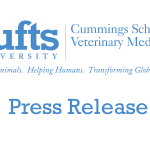 The Cummings School of Veterinary Medicine’s Wildlife Clinic will release a red-tailed hawk from Charlestown, MA after helping the bird heal from a severe wound on its leg. The bird was brought to Tufts’ Wildlife Clinic by the Animal Rescue League of Boston on December 19 with an open wound on its left leg. After several weeks of daily bandage treatments by Wildlife Clinic personnel, the bird of prey has spent the last few weeks in the school’s 100-foot flight cage for conditioning as it prepares to fly, hunt, and live in the wild. The hawk, known by its case number, W091582, is believed to be a female—judging by its weight—and will be released near the Wildlife Clinic late this morning. The Tufts Wildlife Clinic, which is licensed by the state and federal government as a wildlife rehabilitation center, receives no compensation for the cases it treats. The facility, one of just a few stand-alone academic wildlife clinics in the nation, is funded solely by private donations from individuals and foundations, as well as the Cummings School itself. Today’s release is the first of two slated for this week. The other, a red-tailed hawk from Shrewsbury, MA, was brought to Tufts Wildlife Clinic with wing fractures and gunshot wounds in November. After the bullets were surgically removed and its wing repaired, the bird is ready for release by its finder. Returning wildlife back to nature is always a best-case outcome, said Florina S. Tseng, DVM, assistant professor of environmental and population health and director of Tufts Wildlife Clinic. To have watched this bird’s wound heal over time has been a rewarding experience for the whole team—and her taking flight today was a beautiful sight. 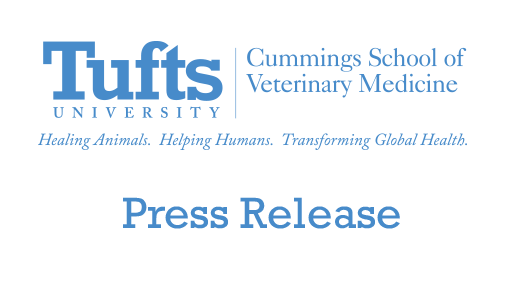 Tufts Wildlife Clinic is staffed by faculty veterinarians, interns, veterinary students and technicians, and volunteers. The Cummings School treated 75 red-tailed hawks last year out of more than 1,600 total cases—ranging from porcupines and beavers to turtles and baby birds.